Playing by ear with the left hand is actually easier than with the right hand. But it's much less intuitive. You need to have a little theory to know what you're doing. Excellent post. Playing by ear CAN be taught. Just a little willingness from the student and new doors of piano playing open up! 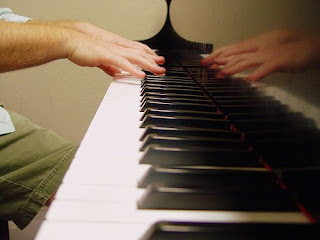 I was looking for good blog to meet my friends need of learning piano so i get it here it really nice. I took Robert's "Playing by Ear" course on tape. The most useful thing for ME as a song writer, was knowing what chords to try while I sing the melody on top. It worked out pretty well ... my new musical is up and running thanks, in part, to Robert Laughlin. Probably you will probably have asked your self: "Exactly how can I be just like any of them?" Well, the 1st thing you musicalstudy got to actually do is to make a change and study the acoustic electric guitar.